Dr.G.Thiruvasagam, Vice-Chancellor of Madras University and former Principal of Yadava College was awarded the “Best Social Worker Award” for his meritorious service to the visually challenged by Dr.A.P.J.Abdul Kalam, former President of India. Prof.P.Rengan, Principal of the college has been awarded “Rastriya Vidya Saraswathi Puraskar Award” for his outstanding achievements in social service by the International Institute and Educational Management, New Delhi on November 24, 2009. Dr. P.S. 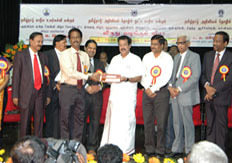 Navaraj received the ‘Best Scholar Award’ of the Government of Tamil Nadu in September 2008. Dr. P.S. Navaraj had received outstanding Water Voice Messenger award by 3rd World Water Forum, Japan in 2003. Dr. P. Alagesan, Associate Professor in Zoology has been conferred with the “Best Teacher Award” for the year 2008-2009 by TANSCHE, Govt. of Tamilnadu. Dr. P. Alagesan received the ‘Best Paper Presentation Award’ at the International Science Congress held in Malaysia in 2005. Mrs. M. Ragam, Lecturer in the Department of Physics had received the ‘Best Paper Presentation’ award at the National Conference held at Thiagarajar College of Engineering on December 2, 2009. During the last five years, the following teachers have been recognized and honored by the Management for their yeomen service.